Our Holographic Notch and SuperNotch® Filters are fabricated by recording interference patterns formed between two mutually coherent laser beams, unlike conventional interference filters, which are made by vacuum evaporation techniques. Since all layers are recorded simultaneously within a thick stack, the optical density of the notch filter is high and its spectral bandwidth can be extremely narrow. Also, since the layering profile is sinusoidal instead of squarewave, holographic notch filters are free from extraneous reflection bands and provide significantly higher laser damage thresholds. *Contact Kaiser for specs outside the listed range. Environmental Stability No detectable performance change after cycled between -50ºC to +80ºC and returned to room temperature. In the available wavelength range specified in the preceding table. AR Specific wavelength range AR coating are available on request. 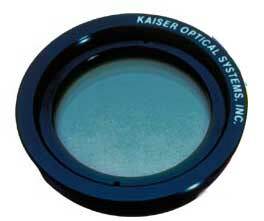 Kaiser manufactures all of its filter products at our Ann Arbor facility. Contact Kaiser to talk with an engineer for filter specifications outside the listed ranges.